For more information on the Idol franchise worldwide, please refer to the Idol franchise page. American Idol is a popular musical-based talent competition that aired on FOX for 15 seasons. It is slated to air on ABC during the 2017-2018 season. 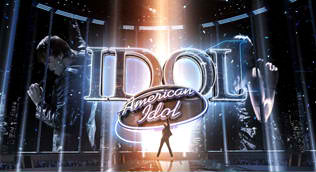 The show is a season-long talent search for America's best singer to become the next "American Idol". The process involves an elimination format of several audition episodes and semi-finals rounds to determine a group of 10-13 finalists that compete in weekly themed live rounds until one finalist is crowned the winner. For eight seasons, it was the highest rated program in the United States, routinely doubling the ratings of comparable juggernauts CSI and Desperate Housewives with ratings of up to 30 million viewers. Due to its huge popularity, American Idol has seen more than its fair share of controversies and dissent, but despite a handful of negative publicity, both media and viewer attention are unwavering. Over the years, the show has gained the support of many well-known stars, with numerous appearances onstage and as mentors to the contestants. The winners of American Idol usually receive the biggest amount of success out of all reality show winners, with the original winner, Kelly Clarkson, receiving worldwide renown as a singer. Other prominent winners include Fantasia, Carrie Underwood, and Phillip Phillips. Several non-winners have also received considerable success post-show, notably Chris Daughtry and Jennifer Hudson. The judges panel stayed consistent for the first seven years, featuring Simon Cowell, Paula Abdul and Randy Jackson, with a fourth judge, Kara DioGuardi added in the eighth season. However, after the show's eighth season, Abdul decided not to renew her contract, leading to her being replaced by Ellen DeGeneres. The judging panel of Cowell, DeGeneres, DioGuardi and Jackson only lasted for one year, after which Cowell, DeGeneres and DioGuardi all left, leaving only Jackson as a veteran judge. Singer/actress Jennifer Lopez and Aerosmith singer Steven Tyler joining Jackson for a revitalized tenth season and continuing into the eleventh. Lopez and Tyler left after the eleventh season and were replaced by country singer Keith Urban, hip-hop rapper Nicki Minaj, and music legend Mariah Carey. After a tumultuous season plaqued by controversies and sharply declining ratings, Minaj, Carey, and Jackson left the show. In the currently airing thirteenth season, Urban is joined by singer Harry Connick Jr. and Lopez, returning after a one-year absence. The series is based on Pop Idol, the original UK version of the show. Contemporaries of the Idol franchise include Endemol production The Voice and Simon Cowell's The X Factor. This page was last modified on 22 March 2019, at 18:24. This page has been accessed 33,013 times.